Pages accessed beyond this point report hypothetical testing results of the Universal SA trading system. No independent party has audited the hypothetical performance record shown below, nor has any independent party undertaken to confirm that they reflect the trading method under the assumptions or conditions specified hereafter. While the results presented below are based upon certain assumptions believed to reflect actual trading conditions, these assumptions may not include all variables that will affect, or have in the past affected, the execution of trades indicated by the program. 1. The performance results assume that no additions are made except for the starting equity of $0.0. 2. The hypothetical record does not include any deductions for brokerage commissions, exchange fees or slippage. To the extent that the fees charged to a client are higher than the fees assumed to be charged to the hypothetical account, the rates of return included in the performance record of the hypothetical account are higher than that which the client would have obtained. 3. The simulation assumes that prices are not influenced by the programs trades regardless of the number of contracts executed. 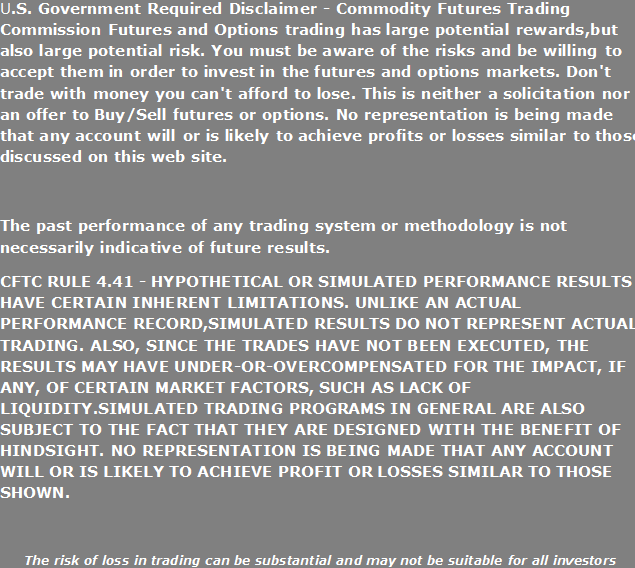 We caution prospective subscribers to take seriously the warning required by the Commodity Futures Trading Commission. PAST PERFORMANCE IS NOT NECESSARILY INDICATIVE OF FUTURE RESULTS. AN INVESTMENT IN COMMODITIES IS SPECULATIVE AND INVOLVES A SUBSTANTIAL RISK OF LOSS. We believe that the performance record presented herein may be of interest to prospective subscribers, but encourage subscribers to look at such information more as a statement of our objectives than as any reliable indication that such objectives will, in fact, be achieved.